Cook the pasta as directed. Drain and don’t rinse. Return it to the pan it was cooked in, or into a serving bowl. In a small mixing bowl, whisk together the olive oil, lemon juice, lemon zest, vinegar, dill along with some salt and pepper. Pour it over the pasta and toss. 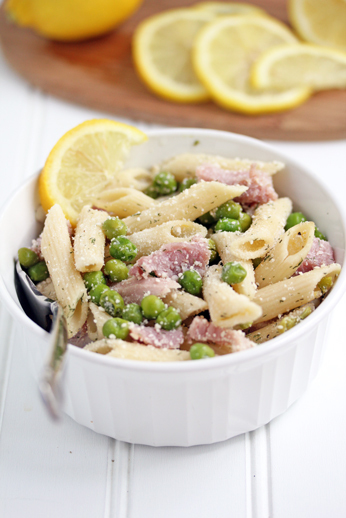 Serve Lemon Pasta with Ham and Peas for lunch or dinner. Printing! Another great one Erin! My goodness! I made this tonight and it was soooooooooooooooo good!! Thank you for this recipes and I love your website. 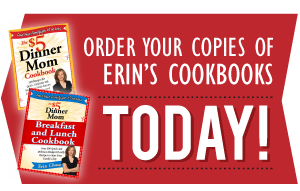 I hope to post my recipes on my new website sometime soon. I haven’t, but I was wondering this exact same thing today. I wonder if the dressing would be weird warm? I just don’t know.